The "Book of Mormon" is further reviewed in the scholarly book "The Mormon Conspiracy" at the website link; The Mormon Conspiracy to Rule America. 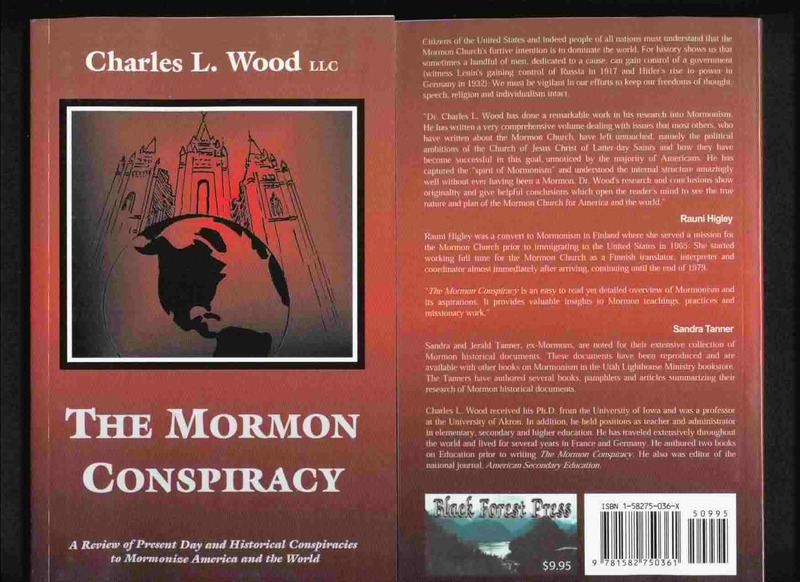 "The Mormon Conspiracy", by Charles L. Wood provides a summary of the origin of the "Book of Mormon", that was conceived by Joseph Smith, who was aided and abetted by his several scribes. It is a story that arose from American Evangelism, which had ignited “ the vast camp meetings at the turn of the nineteenth century, which burned eastward from Kentucky. From the soil thus burned over had sprung both the thousands of believers who could accept a prophet and the psychotic boy who took his puberty walking in the woods and there talked with God, various patriarchs, angels, and demons. The cheap story of the golden plates and the colonization of the American continent by emigrants from Jerusalem, the mumbo-jumbo of illiterate, semi-Biblical, degraded Masonic rituals and the apocalyptic nonsense of the Mormon meta-physics--such things themselves enough to cause trouble on a frontier enthusiastically Methodist and Presbyterian.” 1. The "Book of Mormon", written by Joseph Smith, claimed that the Angel Moroni led him to the golden plates on Hill Cumorah near Palmyra, New York . These plates supposedly were written in a reformed Egyptian language that Smith claimed he was able to translate by seer stones. Smith’s claim that he translated the "Book of Mormon" from these golden plates, was apparently an afterthought, for when the book was first published, he identified himself as the author and proprietor. The fact that the book has also been altered several times from its original printing, shows that it was not sacred, or translated from golden plates by Joseph Smith by the power of God. If it were sacred, or translated, as claimed, by God’s giving Joseph Smith exact words, why would it have been changed in later editions? Even the title has been changed in recent years by the church hierarchy from simply The "Book of Mormon" to the "Book of Mormon, Another Testament of Jesus Christ". Prior to his “discovery of the golden plates,” Joseph Smith had led several treasure digging operations in the area of the Hill Cumorah claiming that he could find treasures by looking through a stone. For this service he charged a fee. According to Scott, Smith was a “money digger” and that the most damaging evidence that Smith was involved in such activities was his being found guilty on March 20, 1826 for being disorderly and being an impostor. He “was accused of having used his peepstone for three years to try (unsuccessfully) to find such things as hidden treasure, lost property, money, gold, a salt spring, and a buried trunk.” 2. At first, Joseph’s wife Emma served as his scribe for the "Book of Mormon", supposedly writing as he dictated to her from the other side of a blanket which divided the room where they worked. In his dictations to Emma, Joseph’s references most likely not only included the Bible, but other contemporary books such as the View of the Hebrews. Many have characterized Joseph as lacking the ability to write the Book of Mormon, and therefore it must have been accomplished with divine help. The fact was that Joseph did have great intelligence with an unusual imagination, and probably knew the Bible in great detail. Brodie underscores his ability by writing: “There is no doubt, however, that Joseph had developed a remarkable facility for dictation. The speed was not ‘far beyond his natural ability’; it was evidence of his ability. To belittle his creative talent is to do him as great an injustice as to say that he had no learning-- a favorite Mormon thesis designed to prove the authenticity of the book.” 3. Smith claims, in his Book of Mormon, that the one of the main characters of a group of people that he called the Lamanites immigrated from Israel and were ancestors of the American Indian. Actually, archaeological and DNA studies of the Indians in the Americas have been numerous and fruitful since Smith’s time. Diggings and studies reveal the steady migration of the ancestors of the American Indians came from China through Siberia over the land bridge into Alaska, and eventual settling throughout North and South America. Fagen estimates that Homo sapiens moved into Siberia [setting the stage for entry into the North American continent] about 35,000-40,000 years ago and were supported by a diversity of game animals, including rhinoceros, musk ox, steppe bison, reindeer and the wild horse. Studies of sites in Siberia, confirms Fagen’s findings. 4. That the American Indian is a descendant of the Eastern Asians (as opposed to Joseph Smith’s claim in his Book of Mormon, that the Indian Lamanites were descendants of Israel ) is based upon extensive studies of dental morphology of Eastern Asian and Indian burial sites, which show a clear ancestral relationship between the two groups. Further, Fagen shows that geological studies reveal the existence of a “land bridge” between Siberia and Alaska which lasted until about 14,000 years ago. This area and lower coastal areas were obviously settled for many centuries before 14,000 BC, but are impossible to study today as the area is now covered with sea water. 5. The flooding of the Siberian-Alaska land bridge which occurred between 13,000 and 15,000 years ago, forced the migration movement to higher ground. This is evidenced by the studies of sites in Alaska and the Yukon. After this time, humans spread gradually through the Arctic into Greenland, through Alaska, the Yukon and along the Pacific coast to California and eventually throughout North and South America. Indians hunted bison on the plains of North America for nearly 12,000 years, during which time their customs and hunting techniques changed very little. And they would be doing the same today, if the Europeans had not arrived in the 15th and 16th centuries AD. An article in Discovery Magazine (June 1998) reported that the earliest evidence of human presence in the New World was found in a 12,500-year-old site in Chile called Monte Verde. Due to the length of time it would take for the migration of Siberian hunters to move across the Siberian-Alaskan land bridge to Chile, it was estimated that the Chilean ancestors may have begun their migration into North America at least 22,000 years ago. This is far earlier than Smith’s story shows. The Mormon Church has spent large sums of money and expended tremendous efforts to prove the archeological truth of the Book of Mormon. But not one shred of evidence has been found to verify this claim. Thomas Stuart Ferguson, a former defender of the faith, who used large monetary grants in an attempt to prove the truth of Joseph Smith’s hoax, became disillusioned in his efforts. Tanner and Tanner write: ... “that he (Ferguson) had come to the conclusion that Joseph Smith was not a prophet and that Mormonism was not true. He told us that he had spent 25 years trying to prove Mormonism, [through archeological research] but had finally come to the conclusion that his work in this regard had been in vain. He said that his training in law had taught him how to weigh evidence and that the case against Joseph Smith was absolutely devastating and could not be explained away.” 6. This scholarly text was written by Charles L. Wood, Ph.D. Emeritus Professor at the University of Akron. (c) Copyright 2006 HOME "Book of Mormon"